This morning sunrise over these Texas bluebonnets and hay bales had a nice sprinkling of red through out from the Indian paintbrush which was a spectacular show of wildflowers on the rural back roads in our state. 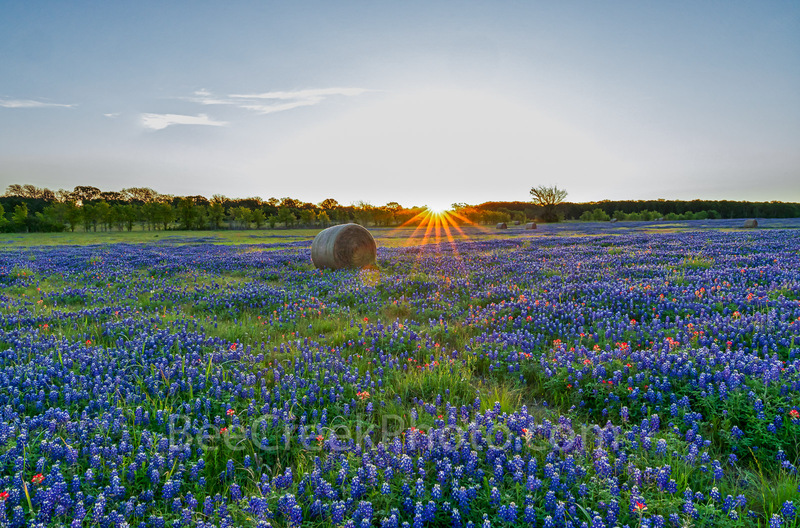 The morning sunrise created these nice sunrays that filter over the top of the trees and spread out over this large field of Texas bluebonnets and other wildflowers with these round hay bales in the field. 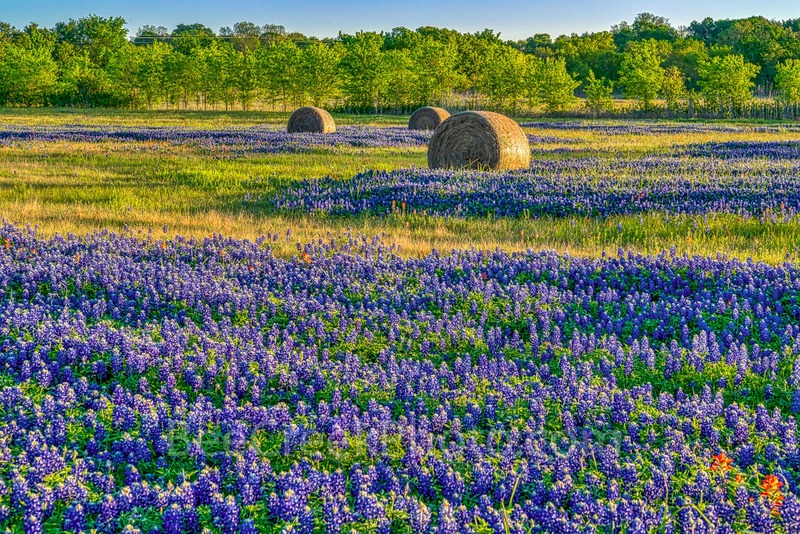 We will show more of these images of the bluebonnet and hay bales over the next week in our photo of the day because they were so unique in this neck of the woods. This was the best field of bluebonnets we found this year so we came back several days to photograph it. Lucky for us the rancher gave us permission to come on his property and photograph this great field of wildflowers in this rural Texas setting. So of course we came back for a sunset photo too. You don’t see bluebonnets fields with hay bales like this in our area so this was a unique find in our quest for all images of wildflowers. When it comes to blueblonnets wildflowers Texans including myself go a little nuts over them, people come from all over to see them, take selfies in them, do family portraits, and for many other reason. In any case it is a very popular spring flower and there are people who follow the yearly wildflower reports like a bible just to find the best of the best every year. Now every years is not a bumper crop so it really depends on the weather, amount of rain we receive in the fall and again in the spring, and I have been told (not verified) they come up better every other year and if they were allowed to seed properly or not. The bluebonnets Lupines or Lupinus Texensis are the state flower of Texas. However, all lupines or considered the state flower in Texas. There are several other types in Texas such as the Lupinus Havardi or Big Bend Bluebonnet, the Lupinus Argenteus or silvery lupine, and several more but the most popular for most people is the ones in this field the Lupinus Texensis. As long as there are bluebonnets in Texas we will continue our quest to capture the best of the best every year. Sunrise over these Texas bluebonnets and hay bales with pops of red from the indian paintbrush through out this field of wildflowers. 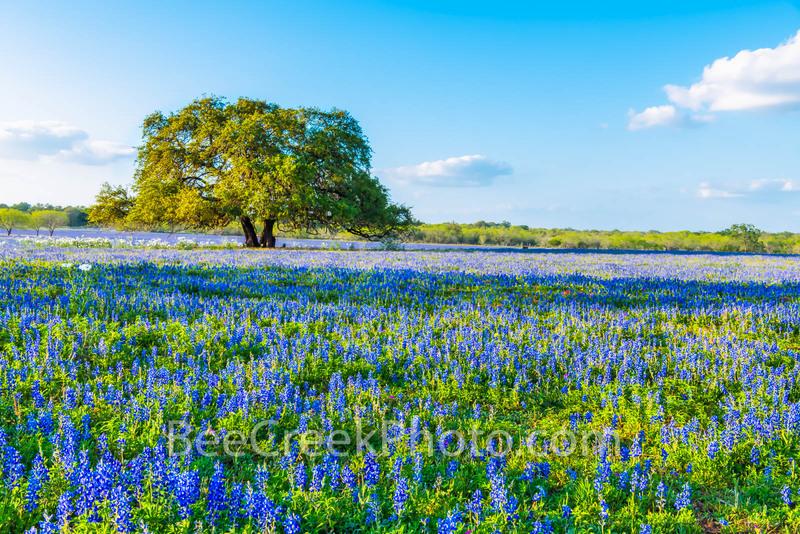 We got here right before sunrise and as the sun rays came over the trees we capture this bluebonnet image as the morning light lit up this field of texas bluebonnets wildflowers. This was the best field of bluebonnets we found this year so we came back several days to photograph it. Lucky for us the farmer gave us permission to come in and photograph this great field of rural texas wildflowers. Posted in Photo of the Day and tagged beecreekphoto.com, bluebonnet, bluebonnet field, Cynthia Hestand, farm, field, field of bluebonnets, field of wildflowers, Haybales, indian paintbrush, light, lupine, lupinus texensis, pop of red, ranch, rancher, rays, red, round hay bales, rural texas, spectacular, spring, springtime, state, sun, sunrise, texas bluebonnet wildflowers, texas bluebonnets, Tod Grubbs, wildflowers on May 1, 2018 May 1, 2018 by Bee Creek Photo.